RLJ Entertainment recently send us over information for their upcoming release "The Osiris Child: Science Fiction Volume One" The film stars Kellan Lutz (Expendables 3, The Twilight Saga, HBO's "The Comeback"), Daniel MacPherson (Infini, Shannara Chronicles, The Cup), Isabel Lucas (Transformers: Revenge of the Fallen, Knight of Cups) and Rachel Griffiths (Hacksaw Ridge, “Six Feet Under”). Special features on the DVD & Blu-Ray includes deleted scenes, music videos, a photo gallery, a concept art gallery and five featurettes on “the making of "The Osiris Child: Science Fiction Volume One"
"The Osiris Child: Science Fiction Volume One" hits retail on December 5th. 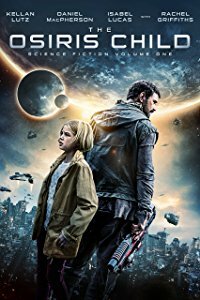 RLJ Entertainment (NASDAQ: RLJE) is set to release the sci-fi film THE OSIRIS CHILD: SCIENCE FICTION VOLUME ONE on DVD and Blu-ray/DVD combo on Dec. 5, 2017. Director Shane Abbess (Infini, Gabriel) co-wrote the script with Brian Cachia (Infini). The film stars Kellan Lutz (Expendables 3, The Twilight Saga, HBO's "The Comeback"), Daniel MacPherson (Infini, Shannara Chronicles, The Cup), Isabel Lucas (Transformers: Revenge of the Fallen, Knight of Cups) and Rachel Griffiths (Hacksaw Ridge, “Six Feet Under”). RLJE will release THE OSIRIS CHILD: SCIENCE FICTION VOLUME ONE on DVD for an SRP of $29.96 and on Blu-ray/DVD combo for an SRP of $34.97. In THE OSIRIS CHILD: SCIENCE FICTION VOLUME ONE, when a dangerous outbreak threatens to destroy everyone living on a newly colonized planet, Lt. Kane Sommerville (Daniel MacPherson) goes against orders and leaves his station to rescue his young daughter (Teagan Croft). Desperate to get to her before it’s too late, Kane enlists the help of an escaped prisoner (Kellan Lutz) as they battle their way through the chaos of a planet on the verge of annihilation. With the odds stacked against them, saving his little girl may be humanity’s last chance at survival. THE OSIRIS CHILD: SCIENCE FICTION VOLUME ONE DVD and Blu-ray/DVD combo have bonus features that include deleted scenes, music videos, a photo gallery, a concept art gallery and five featurettes on “the making of” THE OSIRIS CHILD: SCIENCE FICTION VOLUME ONE.